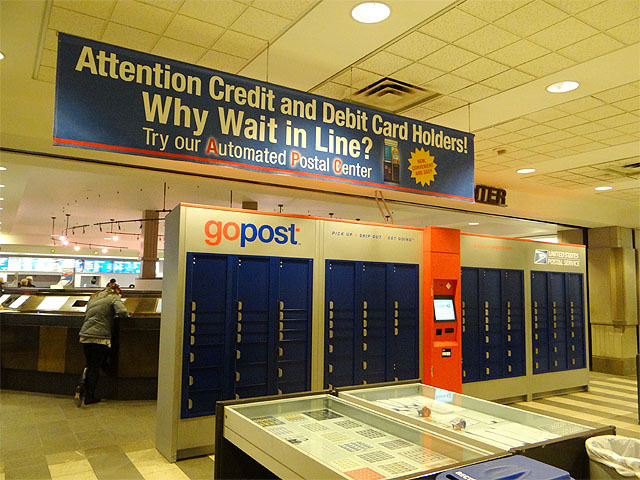 USPS introduced gopost kiosks, a proprietary self-service parcel locker service, just over a year ago in the D.C. metro area. Designed to be placed in high-traffic locations and used at any time of a customer's choosing, registered users can both receive parcels from -- and deposit prepaid packages in -- secure lockers. The kiosks are imposing: they are about 20 feet long and nearly eight feet tall. 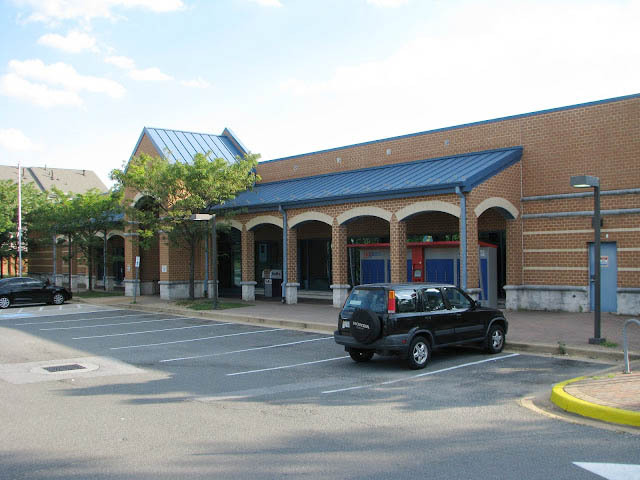 The structure is gray yet modern, featuring vibrant blue and red accents and a sloped roof. The structures are freestanding, but are designed to be tamper-proof in both the front and the rear. Most importantly, the kiosks increase access to USPS services. The author also suspects that gopost kiosks are also intended to shorten lines (in postal parlance: "improve WTIL:" Wait Time in Line) at post offices with busy Inquiry windows. (14) Large: 12" x 15" x 18 1/2". The first kiosk outside the D.C. metro area opened in Manhattan early February: the new unit at the Grand Central Station post office (outside Grand Central Terminal) opened to the public and saw its first customer usage on February 1. Its availability was announced by USPS New York District Manager William Schnaars at the first-day ceremony for the Express Mail-rate Grand Central Terminal stamp that afternoon. The kiosk at the Manhattanville Station on 125th Street opened soon after. A recent query to a staff member at that location suggests that the service is slowly gaining awareness and sees at least modest use. 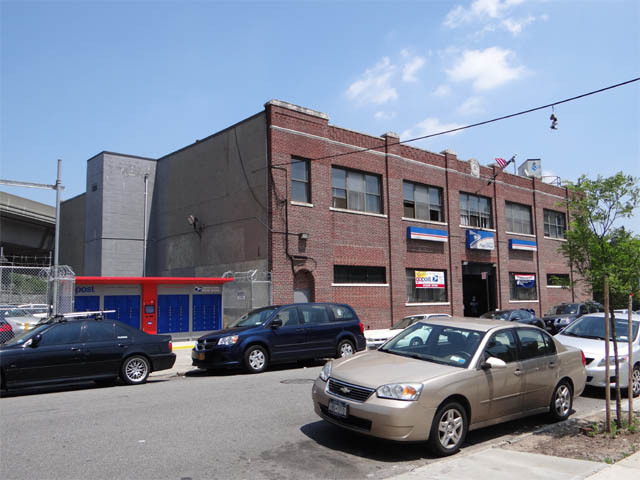 On May 1 USPS expanded gopost to New York City's most populous borough: Brooklyn. The program was announced as a USPS Local News story a week prior. USPS Vice President Rick Uluski, USPS Triboro District Manager Frank Calabrese, and Brooklyn's legendary Borough President Marty Markowitz each spoke. Follows are observations and photos of each of the gopost locations in New York City. At Grand Central Terminal's Grand Central Station post office, there can be as many as a dozen postal clerks on duty at any given time. (In fact, the operation features more staffed windows than this postal tourist has ever seen; again, that's over 5,000 post offices.) Retail hours are 7:30am9:00pm weekdays (7:30am1:00pm Saturday) though the lobby is open 24/7, which means that the office's gopost unit and the post office's Automated Postal Center are accessible all hours, as intended. The kiosk is instantly visible upon entry. West Harlem's Manhattanville Station is very busy in its own right, and featured three active retail windows plus an Inquiries staffer when I visited last month. The gopost kiosk, whose profile is visible upon entry, commands attention but is not immediately inviting. More visible is the Automated Postal Center which faces the entrance. Retail hours are 8:00am7:00pm weekdays (8:00am4:00pm Saturday); however, the lobby closes with the retail windows, meaning both the APC and gopost kiosk are not available at all times. This mitigates their effectiveness. 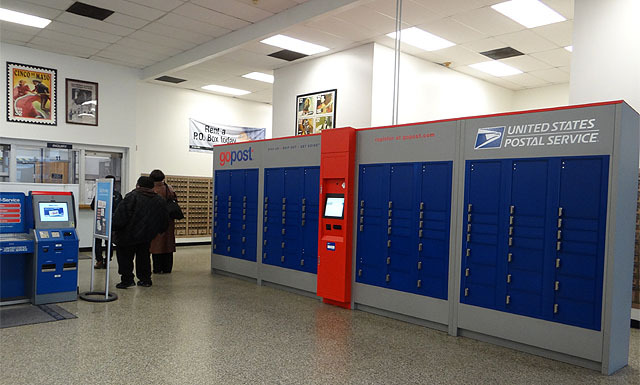 Good additional candidate post offices for gopost units in Manhattan include the Rockefeller Center Station (among USPS's most expensive leases in the country) and FDR Station (East Side hub) post offices. A kiosk might look out of place inside the General Post Office / 'JAF Station'. 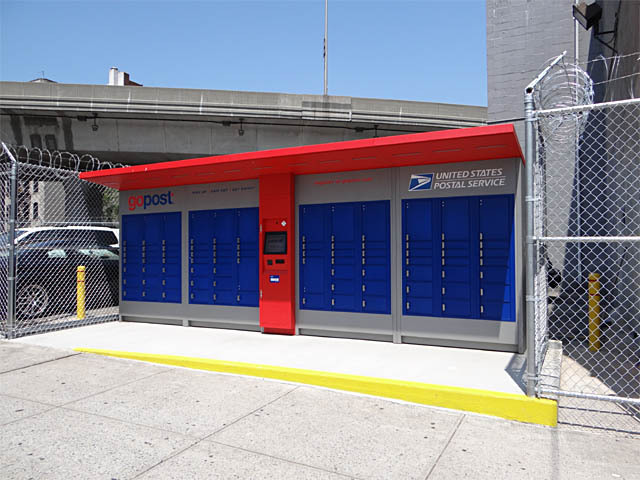 From experience, Brooklyn's Williamsburg Station post office is a reasonable location for a gopost kiosk. I say this because, in a community that has nearly doubled its residential population within the last decade, this post office is woefully overcrowded and lines can be dreadfully long. Until last year the neighborhood's postal operations were supported by a Contract Postal Unit called the Better Letter CPU, yet that was forced to close due to a bizarre provision in the most recent USPS contract with the American Postal Workers Union (APWU). You can find my full write-up of that closure here. Essentially, anything to mitigate the wait times and provide additional postal services to the people of Williamsburg is welcome news. Retail hours for the Williamsburg post office are 9:30am5:30pm weekdays (9:30am4:00pm Saturday). But that doesn't matter in this instance because the gopost kiosk here is located outside. It features the red roof without the supports. From the looks of it USPS spent a lot of money implementing this unit: it recessed the barbed-wire fence (presumably sapping a couple of parking spots in the process) and flattened the sidewalk to create a sort of mini handicapped-accessible platform. 1. Complete the Authentication Sheet enclosed in the packet. 2. Take the Authentication Sheet to one of the Post Office™ locations listed on gopost.com/poauthentication. 4. Receive a confirmation email that your registration is complete and your account has been activated. Your new gopost card is for you only. Like a credit or debit card, only you should use your gopost card and assigned PIN. Other adult-aged (18 or over) individuals interested in using gopost may register free of charge for their own account, card, and PIN. Yes, we get it -- this is the Postal Service's automated way of asking you the question "Does this package contain anything liquid, fragile, perishable or potentially hazardous?" But herein lies the fallacy: USPS is applying its bureaucratic processes onto what is supposed to be an entity designed for convenience. And that just won't work. The Office of the Inspector General reported, on May 6, on the results of USPS's initial gopost trial. The report found that "the Postal Service has not made any changes to its complex registration process," even after a full two-thirds of users who had initiated their registration process "gave up on their registration before finalization." Meaning, two in three people who thought they might want to utilize the system were turned off by the process needed to take part in it. Turning off two-thirds of your potential customers is never good. The 13 original gopost kiosks experienced usage between 1 and 64 parcels per month, per unit. Not per locker; per the entire cluster of 80 lockers. Data for specific kiosks were redacted in the public OIG report. So what does Going Postal make of it all? 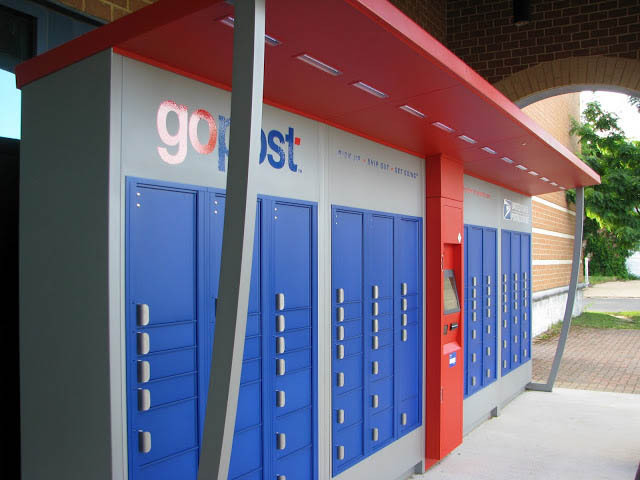 These gopost parcel lockers are cool, but: 1) unless they're placed in convenient locations; 2) unless people passing by can immediately figure out what the kiosks are for and why they should use them; and 3) unless the registration process is improved, then the program will be a flop. I go by the Arlington, VA, GoPost units frequently. I have never seen anyone using one. I've made many attempts to use the Gopost unit in Manhattanville and about 50% of the time I've experienced some sort of problem. Let me count the ways: Online retailers don't realize that UPS packages cannot be sent to this unit, so my soap(dot)com order never made it. Another time, the postal employees held my package behind the counter by mistake. Once my package was damaged. For another package, I received an email that it was ready to be picked up, but it wasn't in the unit - the staff had to engage in a frantic search for it behind-the-scenes after I called the Gopost hotline. I've mailed two outgoing packages from the unit, and both have sat in the locker for 3-5 days before being picked up. The receipt printer doesn't work and doesn't warn you until AFTER the door is re-locked on your package. I can't get an answer as to whether or not the Express Mail guarantee is valid for packages mailed from Gopost lockers, but since I know that outgoing mail is not retrieved on a daily basis I don't dare try. rudely and your packages with flippancy. But about half the time it has worked flawlessly for me. When the staff do their jobs the system is quite convenient. Maybe the adjustment to new services at this post office is particularly jarring for the overworked staff. But Gopost isn't quite ready for prime time at Manhattanville. Hopefuly it will be soon. I signed up online for GoPost, received my card by mail, and then went to the main Post Office in Brooklyn (my local) to present my identification. After waiting on a long line, the Postal Clerk did not know what she was supposed to do with my application form, even after reading the letter of instructions. With some distain she sent me to another window, where I had to ring a bell and wait for another clerk who also knew nothing about checking my ID. She said one clerk who might know something was out to lunch, and another clerk was on vacation. She then asked me to wait while she looked for another clerk. After waiting 5 minutes I left because I could see there is no point in pursuing the completion of my application. Postal employees at this main post office only know that the kiosks are in their lobby. They have not been informed about the service, or trained in how to set up customers; and, I was weary from the start that it would take time for vendors to make use of the service. After having read other posts on this service, I can see that GoPost was prematurely launched. The USPS needs to do some work internally and externally to get this service ready for market. Will the size of the 'GOPOST' boxes eventually increase and as a business person who travels continually will I be able to send and receive packages from any 'GOPOST' kiosk in the postal system. GOPOST is a R&D project, the original ideas are like Jerrynine said, it'll allow people to ship/receive packages wherever GOPOST unit resides. The major goal is to secured the packages in the locker for customer pickup instead of letting it sit on the front door. Of cause the long term goal is to let people have a secured way to ship/receive the package when they are on vacation or business trip. If GOPOST is going to expand, that depends on customer usage. More people use it, the more likely it will expand.